To my beautiful friend Francine! Today is a day to celebrate love: with your lover (or lovers), with your family, and very importantly with your friends. Its a time to show appreciation to all those people in your life who support you, who always know how to put a smile on your face, and who are there to cry with you when you need them to. So today, I want to dedicate my post to thanking you for being my friend, for starting this wonderful blog journey together, and for always being there to talk endlessly about food and everything else. You are a wonderful person, and I am so happy you are my friend. Use an electric mixer to cream the butter, sugar and salt until well combined. Add the egg and mix until smooth. Use a spatula to scrape down the sides of the bowl a couple times along the way. Add the flour and pulse the mixer on and off, low speed, until the dough comes together and has a moist appearance. Divide the dough into two equal pieces, shape each into a ball, press into 1/2-inch thick disks, and wrap in large piece of plastic. Chill for at least an hour. Preheat the oven to 350F / 180C. Place a rack in the middle of the oven. Unwrap plastic, straightening it out, placing ball of dough in the middle. Lightly flour top of dough ball, and rolling pin. Roll out until the dough is large enough to line your tart pan. (Should be about 1/6 – 1/8 inch thick.) The reason for rolling out on plastic wrap, is that it is much easier to transfer to pan and you need a lot less extra flour. Carefully lift the plastic with the rolled-out dough in it, and transfer to pan turning it over. Work quickly to ease the dough into place, taking care not to stretch the dough. Press it along the bottom of the pan, out to the walls, and against the sides (again plastic helps your hands to not stick to the top of the dough). Remove plastic, peeling it off very carefully. Trim any excess dough. Chill in the refrigerator for 10 minutes or so. 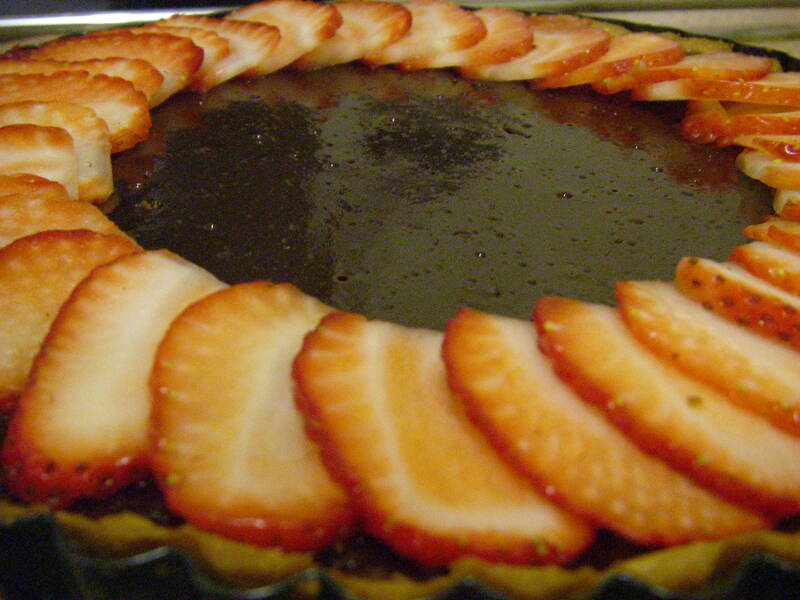 Pour the filling into the cooled tart shell and bake for about 15 minutes, give or take a couple minutes. 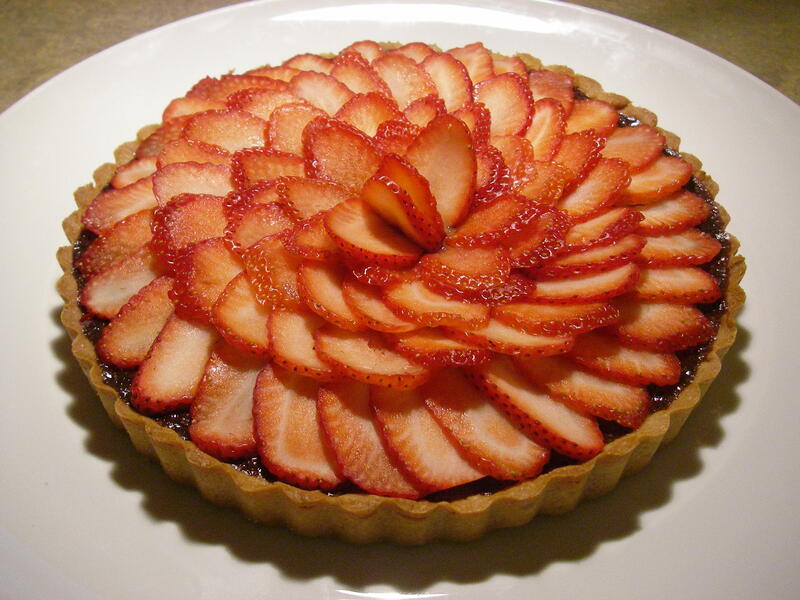 The filling should be set around the edges a bit darker than the center in color. The center will be a touch jiggly, that’s o.k. Let the tart cool completely, preferably in the pan on a cooling rack. When cooled completely, it’s time to decorate! Either using your mandolin or a knife, thinly slice 7-8 strawberries. Taking the slices arrange them in ring formations, slightly overlapping them, as you can see in the photo. 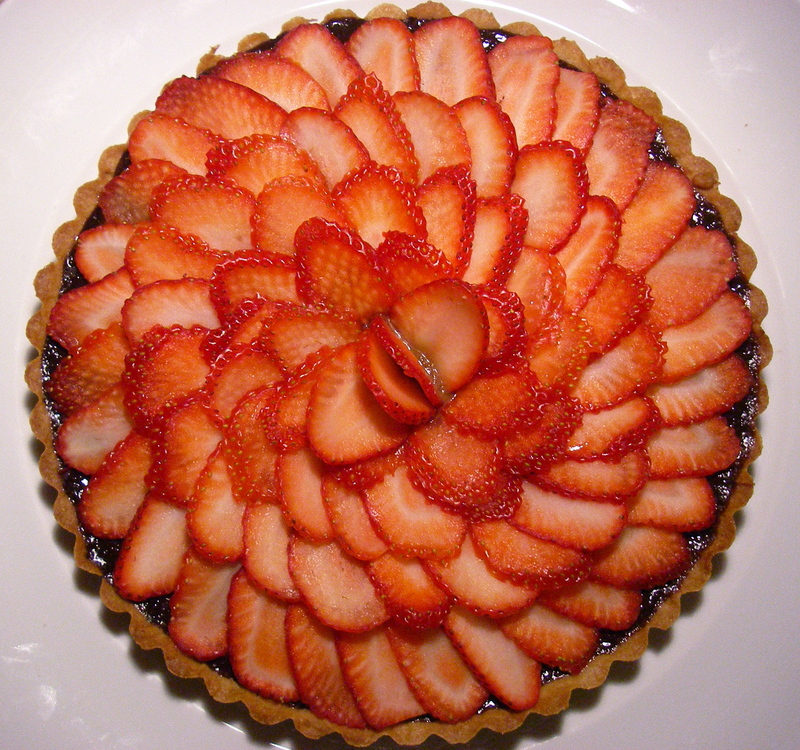 Working from the outer ring and moving inward, keep making rings of strawberries until you reach the middle. 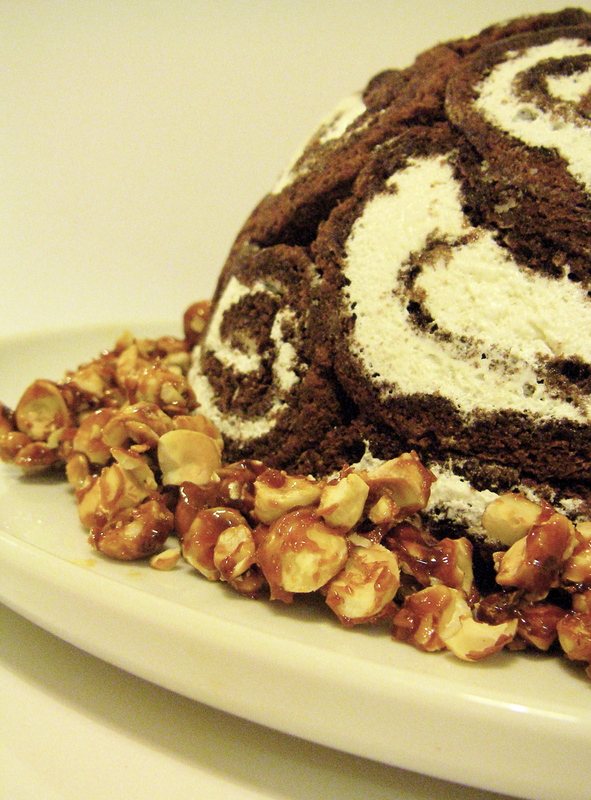 I recommend serving chilled, as it is easier to slice and the chocolate has the richest texture. 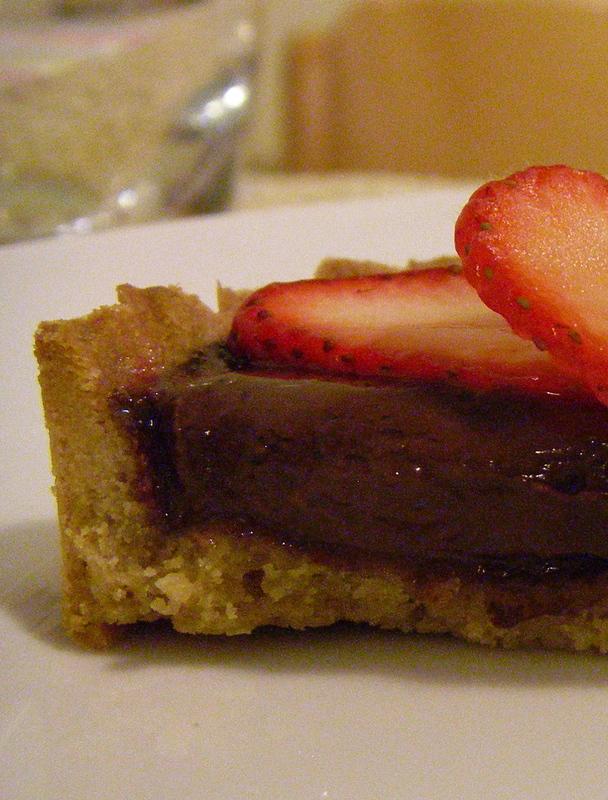 Seducing Cupid: Strawberry dark chocolate tart!